To develop a big strong wide back, there has to be one common motion in every back routine. To develop a big a strong wide back you have to do a lot of pulling. Then you have to go out and do some more pulling, and then usually even more pulling. The fundamentals of wide back training is based a lot of pulling. Think of some of the most common and best exercises for back width, Pull Downs, Pull Ups, Wide Pulley Rows, and Pull Overs. See a commonality in the names? If you really want to get some great back development you going to have to learn to pull things from a variety of directions and angles. You're probably sitting there going how can someone talk about back training when they do not mention rowing exercises. I do feel rowing erxercises are a very important part of a solid back routine. However, a lot of times rowing movements become more about how much weight someone can move and not about feeling the back muscles work. The key emphisis of rowing movements with back training is to help develop overall thickness. 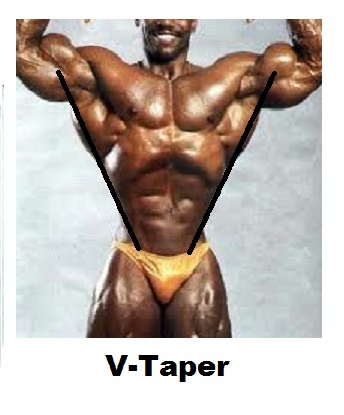 While a thick back is great it is not as awe inspiring if it does not have much of a v taper. If your goal is overall back development lets cut back on the rowing and start pulling. How many times have you seen someone do something that was supposed to be a lat pulldown but looked either more like a full body lean or a" use your entire body pulldown". While these jerking motions can help a person move more weight they do a lousy job at actually stimulating the lat muscles. As a matter of fact, next time you see someone doing one of these "wonderful" back exercises be sure to check out their overall back development. I'm prety sure it will be lacking in a few areas. To truely stimulate the lats be sure to do your pulling in a slow controlled fashion. Because the back can be stimulated from so many angles it is important to make sure you are always using controlled form when pulling for the back. Three key pulls angles to use during back training are pulling down, pulling up and pulling over. All of theses pulls hit the lats directly from different angles. 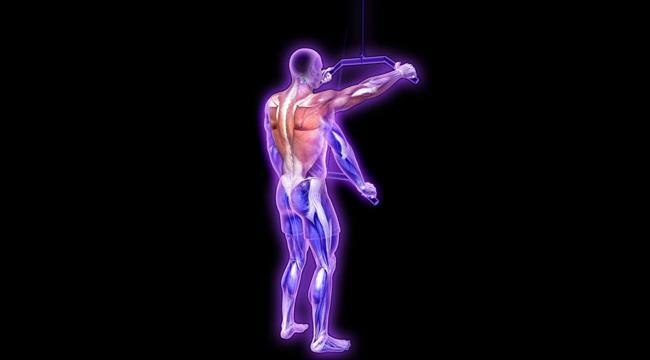 The back has a lot of muscles so to stimulate them requires hitting them from various different angles. Every back workout should include some form of pull over, pulldown, and pull up exercises. By hitting the back from at least these three angles it will help insure that you are taking a well rounded approach to training the back. This will also result in developing a wider v taper. The Pullover is probably the most loved and hated pulling exercise for the back. Some people swear it has done wonders for its back development, while others swear they have gotten nothing but good chest developmement out of the exercise. The truth actually lies somewhere in the middle. The Pullover can stimulate either the chest or the lats but where it hits is more in the mechanics. If you have the option, a pullover machine is probably going to be your best bet for a pullover movements. Unfortunately pullover machines are becoming harder to find in gyms now-a-days. If you dont have access to a pullover machine then using a barbell should be your next option. If your really looking to target the lats foucus on using a bar over dumbbells. With a bar you can perform more of the arking movement that will directly stimulate the lats more. The way a dumbbell is held it causes more chest stimulation than actual lat stimulation. What's the best bodyweight exercise anyone can do for their back? Without a doubt, pull ups are! Well you're probably going to say "If pull ups are so good, how come you dont see everyone doing them on a regular basis." Simply put, because they are really hard and a lot of people can't or dont want to do them. After all trying to do a pull up and just hanging there can be pretty embarassing! I know quite a few people who can squat or deadlift hundreds of pounds but can not pull their own bodyweight up for a pull up. 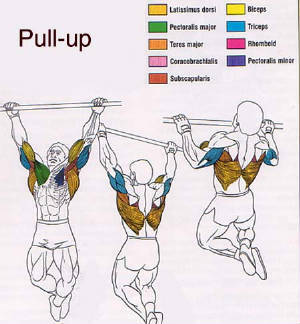 Pull ups are so good they should be a regular part of any back routine. If you can't do pull ups by yourself, start off by doing assisted pull ups with a band. The band will help pull you up making the pull up movement a little easier. These still will not make pull ups a piece of cake but for someone who can't do pull ups this may help them get a few sets or reps in. If using the band is still too hard, you could try using a assisted pull up machine. 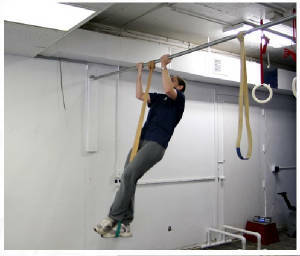 The assisted pull up machine can have the resistance set so that almost anyone can do pull ups depending on their strength levels. The goal should be to eventually work your way to doing multiple sets of unassisted pull ups. One thing is for sure though, the stronger you become at doing pull ups, the better your back development will become. The Pulldown is another exercise that tends to get a bad rep for back training. The problem with the Pulldown is the manner it is performed in. This is probably the number one back exercise you will see performed incorrectly. Jerking, tugging, and a a variety of non back pulling movements. If you really want to stretch and feel your lats, try and perform a pull down with the strictest form possible. Try and keep your torso as upright and still as possible. When pulling down continue to keep the torso stationary and focus on squeezing your shoulder blades together as tightly as possible. When returning to the starting position make sure to let your arms stretch as far as possible while continuing to to keep your torso as still as possible. A strict lat pull down has a much different feel than a "regular" pull down because of the lack of momentum used to pull the weight down. Strict lat pull downs will not only improve your lat development quickly but will also increase your pulling strength rapidly also. Here is another excellent exercise for targeting the lats. Because of the position your body is placed in when performing this exercise all the stress is placed on the lats. Your toso remains still while in a standing position and your arms remain completely straight when pushing down forcing your lats to do all of the work. Much like the strict lat pulldown because the form is kept so tight, your lats can't help but do the majority of the work. To really take your back development to the next level, be sure to include a variety of pulling exercise. While rowing is important for back development, if width is your goal place more focus on pulling movements. Your pulling exercises should target the back from a variety of different angles. Your back routine should have pulling exercises in the form of pull overs, pull downs, and pull ups. The more angles you can target in a back routine by pulling, the more it will help your overall development.